New businesses may begin with the dream of being your own boss and making millions, but all too often, they close their doors soon after the ribbon is cut. Most new businesses that fail are simply overwhelmed by the need to manage tasks, people and suppliers that they didn’t have as an employee, and/or don’t have enough cash to get through the start-up period. With the help of Greene County’s Microenterprise Assistance Program (MAP), lots of new jobs have been created, and new businesses have taken root and grown tall in communities throughout the County. Field Goods in Athens, NY, has been delivering fresh food from small farms in the Hudson Valley to workplaces and open-to-the-public locations for over 5 years. Their weekly “bag deliveries” have become a powerful symbol for local food that comes from our soil and not far-away lands. Field Goods has grown from a one-wagon operation to a company with 40 workers, and their business also creates outlets for local farmers to sell their goods and maintain and expand farms right here. Field Goods was named “Small Business of the Year” by the Greene County Chamber of Commerce in 2016, and received numerous awards for creating jobs for the developmentally disabled. Field Goods received MAP grant funding to start-up and a Quantum Fund loan to fuel their first major expansion. Excel Physical Therapy has expanded from West Coxsackie to Hudson and Catskill over the past 10 years, providing out-patient and rehabilitation services that recover, restore and regain people’s physical abilities. They opened a fourth location in the Hannaford Plaza in Cairo, NY location in late 2016. Excel was founded by two local high school graduates who returned to Greene County after graduating from college, and received MAP education and technical assistance to get their business idea off the ground. Excel has made it big while keeping their business local, creating approximately 20 good jobs in the County. Rive Gauche Bistro has created a French Cuisine Destination in a historic river town building in Athens, after the former winner of the Food Network’s “Chopped” competition decided to move to Athens after being the head chef in several of New York City’s finest restaurants. Rive Gauche, which means “left bank” in French, has become a destination for locals, tourists, and people crossing the Hudson since opening with the help of MAP funding and support in the last round of funding. Verdigris Tea & Chocolate and 394 Main established 21st Century Main Street storefront eateries in Catskill with the help of Microenterprise funding, Verdigris saw a market opportunity and opened a second location to complement their Hudson store, and 394 Main built upon the owner’s existing successful B&B in Catskill to create a second successful business. MAP funding and technical support helped these businesses succeed, and attending the next MAP class can help you turn your dream or start-up business into the County’s next success story. So, what’s so special about the MAP? It helps business owners with capital and business savvy to implement a business plan that grows markets and profits quickly, creating winning businesses that expand jobs and opportunities in Greene County. The two-day class session covers marketing, accounting, cash flow, business plan development and even business regulations and their impact. Participants completing the MAP Class not only gain real-world business skills, but have access to a deferred-payment loan of up to $25,000. The two-day session is free, but advanced registration is required. The first 2017 class will be held on Thursday, March 2 and Friday, March 3 from 9:00 a.m. to 4:45 p.m. at the S.C. DeLucia Training Center at the Greene IDA, 270 Mansion Street in Coxsackie. You can reserve your place by contacting the Greene County Department of Economic Development, Tourism and Planning, and should be requested no later than 4:30 p.m. on Friday, February 24, 2017. 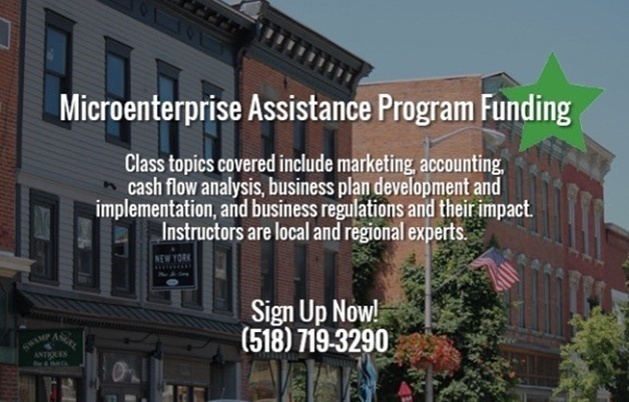 The Greene County MAP has operated since 1998 in order to help small business owners and entrepreneurs to either start or expand businesses, and has received funding from New York State four of the last five times money was available. To learn more about the MAP, visit www.investingreene.com or call the Greene County Department of Economic Development, Tourism and Planning at (518) 719-3290.